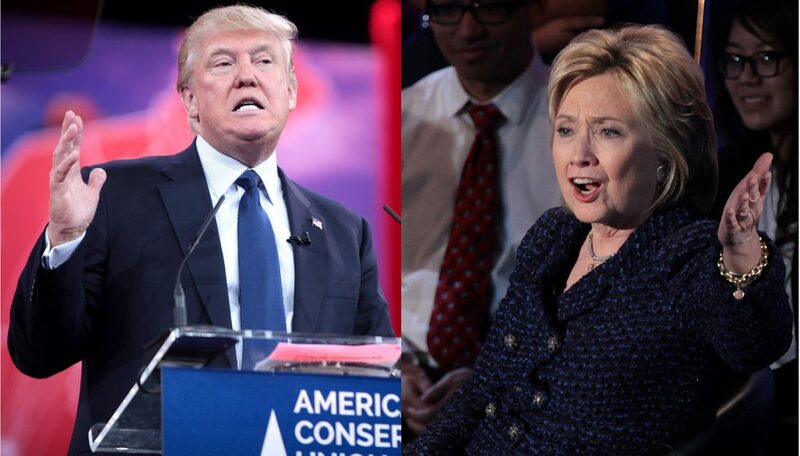 Monday night was the first presidential debate between Democratic presidential nominee Hillary Clinton and Republican nominee Donald Trump — I had many thoughts. I diligently ate my Veggie Straws and watched as the Donald farted around the podium while Secretary Clinton looked on like an all-knowing goddess, wondering how Trump skipped three grades of elementary school (don’t fact-check this, NPR). This debate was the equivalent of a first-grade playground fight, sandwiched between nap time and lunch. For that, I wrote down nearly all of my reactions throughout the debate. I also cussed quite a bit while writing my thoughts down, so not all of this is totally accurate. Without further blabbering, here are my thoughts on the presidential debate. 9:06 p.m. My girl, Hillary, just walked in. I must say, her pantsuit is on point. Definitely one of my favorite pantsuits she’s ever worn. The bright red also probably represents the color of Trump’s actual skin tone, sans the gallons of makeup. Nice touch. 9:08 p.m. Hillary, what is all this stuttering? What are you doing? I think I might projectile vomit. Trump’s oddly calm during his opening statement. This will probably change. Also, why is he talking about Mexico and China so much? Newsflash buddy — our economy is doing extremely well. We don’t need you to give shoutouts to foreign nations in your opening statement. Half of your constituents don’t even know where China is. 9:09 p.m. Hm, it’s interesting that Trump is wearing a blue tie and Hillary’s wearing red. Did they coordinate their outfits? Clearly, the aesthetic was of high importance last night. 9:14 p.m. Fun new drinking game: every time Trump says “China,” drink. Also, the way Trump says “China” leads me to believe that he low-key has a speech impediment. Or nasal passage complications. In my expert opinion, he should probably see several specialists. 9:23 p.m. OK, I’ve had enough. Donald, speak when you are called on! Do you not understand social cues? Did you skip kindergarten, where basic manners were discussed? Lester Holt, my man, grow some balls. Please tell Donald to shut up. Hillary can’t even get a freaking word in. Now I need to take a rest — my little Asian fists have taken to punching the wall every time Trump speaks. My hands may fall off within an hour; stay tuned to find out. Hillary Clinton and Donald Trump toughed it out at Hofstra University on Monday night. PHOTO VIA WIKIMEDIA COMMONS. 9:33 p.m. I hate that Trump is talking to Lester like they’re old friends. Poor Lester — let the man live. New hashtag: #LeaveLesterAlone (use it, don’t abuse it). 9:39 p.m. Braggadocios? Are we for real right now? Is Trump actually trying to sound smart by using bigoted word choices? Here’s a thought: when debating, you’re trying to appeal to an extremely large audience, so try to be as understandable as possible. “Braggadocios” does not appeal to a large audience, or really anyone for that matter. 10:02 p.m. Not the birth certificate! While we’re on this topic, people come to this country because of the opportunity and freedom the United States provides. Why not give them a chance to help serve the country that they love? Also, President Barack Obama was born in Honolulu, Hawaii. This is not a theory or opinion. This is fact. 10:16 p.m. Trump scratches his eyebrow with his thumb so as not to disturb the copious amounts of foundation he has on. Interesting maneuver. 10:24 p.m. Why is Trump drinking so much water? Parched much? Hillary did not take one sip. Not one! I hope he pees on stage. 10:38 p.m. Yes! I have been waiting for Hillary to clap back at this entire debate. Talk about stamina! Donald, don’t talk about negative ads. Go cry on someone else’s shoulder.